New images have been revealed for one of Manhattan’s newest developments, Manhattan West, a US$4.5 billion mixed-use development to be built next to Hudson Yards on Manhattan’s west side, mid town. Designed by Skidmore, Owings & Merrill (SOM) Manhattan West will feature over five million square feet of offices over three office buildings and a mixed-use building/plaza including a 62-storey residential tower, hotel and two-acre public park. A 2.6-acre platform has been constructed over active railroad tracks using post-tension pre-cast bridge technology. Two glass office towers each feature one angled façade and rounded corners. 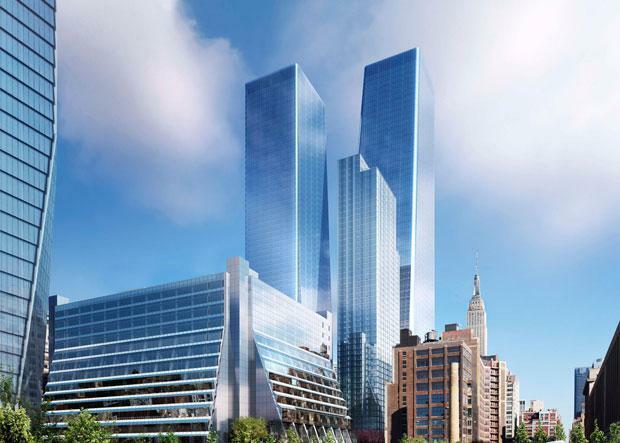 The tallest of the two, 1 Manhattan West, will reach 67 storeys. The first office tower is expected to be completed in 2019. Legal firm Skadden, Arps, Slate, Meagher & Flom LLP is the anchor tenant and will occupy 550,000 square feet on floors 28 to 43. One of New York’s largest developers, Brookfield Property Partners, is building Manhattan West in what is a huge growth area of Manhattan, near Penn Station, and one of the largest underdeveloped parts of Manhattan which was an under utilised rail yard.